We here at ArenaNet just went through a round of interviews telling people about this exciting new Guild Wars 2 profession, the guardian. Not many of those conversations go by without someone wondering aloud if the guardian breaks the paradigm we set to create—a game without the Holy Trinity. These folks are followers of the MMORPG genre who don’t get their hands on Guild Wars 2 every day, so I can’t say that I blame them. After all, what do they have to go on? Some things we said five months ago? A few anecdotes? The insistence of a few dedicated fans who defend us in forum threads? In each interview we try to sprinkle in as much stuff as we can to support our ideas, but when this information isn’t all in one place it loses its weight and impact a bit. So I thought, why not collect all this information in one place? It’s been a while since I wrote the GW2 healing and death article and frankly that article was a lot harder to write when the only profession examples I could use were the warrior and the elementalist. Many interviewers wonder if we are worried about making such a radical change, but to me the whole thing is just common sense for what we are trying to accomplish. I’d be a lot more worried about building GW2 combat with trinity professions than without them. I don’t want to speak for other games or other combat systems, but this system is just better for our game. So what features of the combat system encourage this profession design? The answer to that is, “lot of things,” so let’s talk about them one at a time. Everyone has a dedicated slot on their skill bar where they must place a healing skill. These vary greatly and are an intimate part of the Guild Wars 2 build-making process, but ultimately they are your most efficient and reliable way to sustain yourself in battle. Why did we do this? Because we think it is a more interesting way to create sustained encounters for solo players AND groups while keeping players focused on themselves and their surroundings. The downed system creates combat situations where fallen allies (and enemies in PvP) are actual strategic locations in a battle. It means that situations can change quickly and players must react to them. From level 1, every profession has the ability to revive everyone else. This means that players don’t have to rely on one profession in case someone is defeated both during and after combat. I said that the healing skill was the most effective way to keep you going in a fight, which it is. 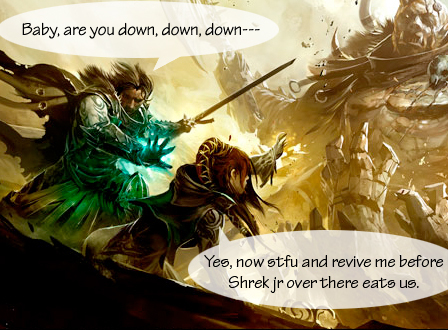 However, in a party, what is more awesome than being able to revive someone who was defeated and doing nothing back to being a contributing member of the group again? We did this because it makes combat more dynamic and social—two of the main goals of Guild Wars 2. The basic buff system in Guild Wars 2 is a set of ally-friendly buffs that we call boons. There are seven boons: Regeneration, Might, Fury, Swiftness, Protection, Vigor, and Aegis. With the exception of the Aegis boon, these are available to different professions on different weapons and skills. Their duration stacks but their effectiveness does not stack, so two players using Regeneration boon are equally effective putting health regeneration on allies. This system allows us to simplify the buff system while also making everyone similarly effective when trying to do something that the system handles. The duration stacking also means that you can’t overdo something, but you also aren’t ever wasting a boon when stacking it. For example, if you put 10 seconds of regeneration on an ally and they already has 5 seconds of regeneration remaining, they will now have a total of 15 seconds of regeneration. More overall health, but not any more efficient. This is one of the big ones. There are no skills that specifically target allies. Everything must be done using positioning, ground targeting or other unconventional methods. This keeps every profession focused on their allies in the world, which adds a tactical complexity to the combat. Instead of watching red bars, we want you to watch your allies in the world. Making sure you are dropping ground-targeted spells effectively and moving into position to block attacks on allies is how we want players to defend each other. Being able to adapt to situations is something that we feel makes combat more exciting. In Guild Wars 2, the combination of weapon swapping and skill versatility give each profession the ability to adapt to combat situations and change their role. Taking too much damage as a warrior? Swap to mace and shield. A bunch of adds as an elementalist? Attune to fire. Even within single skills we try and maintain versatility. A guardian that brings Wall of Deflection or an elementalist with Swirling Aura can use them to defend allies when retreating. They can also use it to push into enemy lines, or they can cast it in a timely manner to counter a particularly dangerous enemy projectile and send the effects of that projectile back to the attacker. Being able to rotate roles and cover for other players is another piece in the puzzle to removing dependencies. Another important part of Guild Wars 2 combat is mobility. We felt that in order to get the dynamic and visceral feel that we wanted combat to have, players needed to be more mobile. A lot of work went into this from animation systems to animations themselves allowing skills while moving. It takes a lot of pressure off of the skill system and puts in back into movement, tactical play, and ground control—the areas where we wanted the game to be focused. Couple that with dodging arrows and double tap dodge rolling and you create a combat system that is more like a first person shooter where finding real cover, flanking and other more realistic fighting techniques find a lot more use. This again de-emphasizes the importance of roles and focuses players on what we intend, which is how their profession plays. We built this game so that they professions act as play styles, not as roles. Each profession can support, control, and do damage. We believe that this creates more dynamic combat and more distinct professions because there are more play styles than roles. One of the best ways to explain this is with an analogy. In a first person shooter there can be a variety of weapons, from sniper rifles to rocket launchers to machine guns and shotguns. No one looks at these weapons and says, “They’re all the same, they all just do DPS.” Why should an MMO be any different? Party wipes when you lose the wrong person. Watching the interface instead of the world. Playing with people because you have to, not because you want to. Being stuck in the same combat patterns over and over again. Anyway, I hope this gives everyone a little bit of insight into the combat of Guild Wars 2, the removal of the Holy Trinity, and profession roles. people really have to understand: in GW2 there are no statistical defense stats like the block/parry/dodge-system in WoW. There is no armor that has such stats, you can't build your character that way. There is only armor, toughness and health. Skill 2: Counter Blow (6s cooldown): blocks the next incoming attack, counters with an attack when in melee range, knockdown 2s. 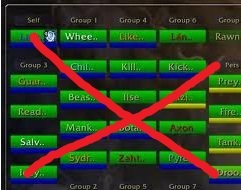 As you can see, it makes no sense to think someone can tank more than 1 mob effectively for a certain amount of time. Defensive skills are very situational (long cooldowns) and have to be timed right, in order to withstand some of the hard hitting incoming attacks. Skill 5: Shield Stance: makes only sense if you guard an other player since you can't move or do anything other than being in your stance blocking incoming attacks. -) you can't tank like in other games. Defense Skills are situational, not continuous! Your defense-skills last only a very short time and have mostly very long cooldowns. You will have to activate them at the right time! -) you can't heal other players. Your self-heal is the only real heal-skill in this game, it has 20s+ cooldown. You can't target allied players. You can only give allies boons (regeneration) and passive heals (hit an enemy and heal nearby allies) which have a very small healing amount. Those supportskills have longer cooldowns too, so again, they are situational. Well like I said in my edit, no they wont be DEDICATED control/support (though maybe control). But there will be players assigned to focus on such tasks. If you have everyone running around doing all 3 all the time you are gonna have coordination issues. and exactly this isn't possible with the cooldowns in the game, look at my example above. You would waste a lot of potential, if you only spam a skill with 90s cooldown. Healing refers to the use of skills to replenish health or remove damaging conditions from oneself or others. Each character has a skill bar slot that must be occupied with a healing skill. The skill in this slot is a self-heal and provides the largest healing effect available to the character. In addition to a healing skill, some professions can select skills that provide minor healing and traits to improve healing. Note that these forms of healing are considerably weaker compared to a self-heal. Because Guild Wars 2 has no dedicated healing profession, a player can not fully devote themselves to maintaining a party's health. Furthermore, healing that is not a self-heal usually manifests as area of effect or as additional benefits of area of effect skills. For example, Healing Rain gives a short regeneration boon to those in the area, Water Trident heals allies around the attacked target and Geyser periodically heals people in its target area. -) the elementalist has a base-health of 2598. -) the support healskill "Geyser" heals for about 39 per sec. other support healskills heal a very similar amount. Do you now see the difference? Supporting allies with heals in GW2 isn't the same as in other mmos. Support-healskills are very weak, you can't outheal a bigger amount of incoming damage. Not possible. You are responsible for yourself, you need to use your selfheals! It makes no sense if someone only tries to heal his party and nothing else. You would be wasting a massive amount of potential here. I think I can't show it any clearer than that. Last edited by Maarius; 2012-03-02 at 04:56 AM. Very nice, should get a sticky on this. Now let this populate the front page while the other thread "How can thre be no trinity" dies. This answers everything asked in that thread and more. Last edited by Malthurius; 2012-02-08 at 04:09 PM. I have to say it once again, I friggin' love their way of seeing on how to improve a game! Their philosophy is great imo. Good thread, Maarius. Also, your thread title is a lot better, compared to previous ones. Less sensationalist. Also, your thread title is a lot better, compared to previous ones. Less sensationalist. thanks It's really a thanks to Jon Peters from Arenanet who wrote this article, all I did was a copy and paste job, but I think a simple link to the blog wouldn't get people to look at it. Used a few pictures for trying to illustrate the points a bit. I think this exact blog post was linked to in that other 'trinity' thread that shall not be named. However it was glossed over. From what i am reading, it is making me quite excited about this game. Thank you for your post and good day. Very nice post. I'd agree with having this as a sticky except...no one reads those. A breath of fresh air on the design field. Very nice. Looking forward to the game! My wife came to me and asked: "What have you done to the poor cat? She is half dead..."
Its not necessarily that people 'refuse' to believe it. Alot of people just like being Tanks or Healers. I personally will try the game out to see if i like the concept but i know a few people that wont touch GW2 with a 10' barge pole simply because they only like to play a healer or tank. I love it. It's a fresh take on an old genre. Nice to see someone doing something different for a change. Instead of the same old thing over and over again. Been looking forward for this game for years now, as I'm sure many people have. Hopefully it will be released sometime this year.